Product photography is usually straight forward, and can be repetitive too. Last week I decided to think outside the light box and come up with something a little more edgy. These shots both required staging, a tripod, a circular polarizing filter, timed exposures, and waiting for the right lighting conditions. The results are a little unconventional, but that's the point. Your work is inspiring and truly a pleasure to look at. Could you be any better with a camera? Doubtful..
Keep up the great work! I can't believe I didnt find your blog before now! Man, when I see a reel I see a fly line holder. 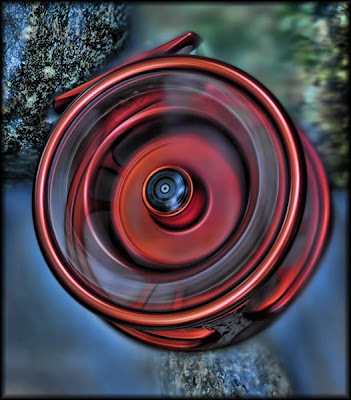 When you see a reel you see vibrant colors and an opportunity to show it's art-ful side. 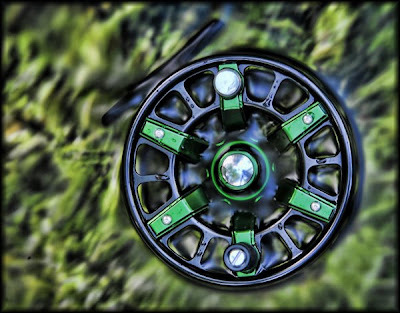 When I see your reel photos I want to go home and just look at my fly reel and see if I can see these amazing images in my own reel. I like the technical side of these shots. Really original and eye catching stuff for sure. Nice work. Ben, Brandon, and Luke -- thanks for dropping in and for the kind words! These shots were off the beaten path and I'm glad to hear others think they are successful images. Gear = Good. nice blog. the photos are awesome. I love the fly pics. I am a Galvan tru belever too. Have a Torque, now with the spoke out there, man do I need anothere reel. Awesome pics. Love the blog. These are beautiful. Really beautiful.